The Still Traveler | books, adventures, etc. : Unremarkey-able and "Finch-tastic"
First book post for 2016! Let's start the year with notes about the books I read from the last few weeks of 2015. I celebrated my birthday last November and waited till my long-awaited holiday break to start diving into the books I received from my 18th. One of which is this book which I received from a best friend. 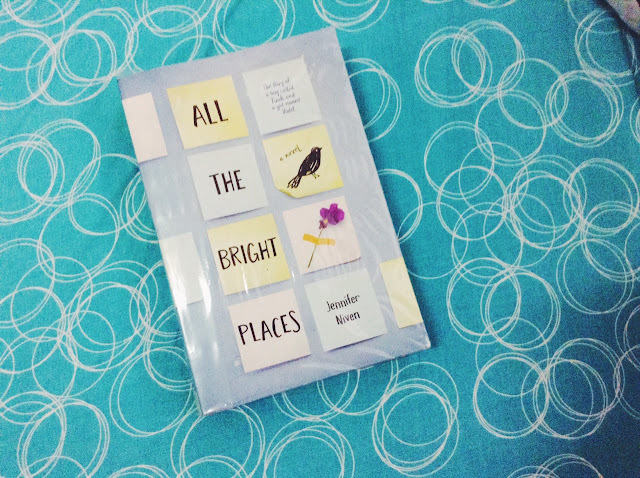 If there's a book that can properly make you see the reality of what goes through life feels like, it's Jennifer Niven's All the Bright Places. If there were fictional characters who will let you see the beauty and destruction that is life, they are Finch and Violet. This book has captured the beautiful in the broken, the wrong in the right, and the right in the wrong. This book wanted to show that, and it achieved exactly that. In my writing class, we would always be lectured by how characters should never be too perfect. Afterall, the only way to make a character a character is when he/she has good bits and bad bits. Finch and Violet had the right amount of good and bad in them. However, I think it wasn't right that the only thing that's "bad" in them are their mental illnesses. Yes, this book, deals with mental illnesses-- a topic that is still in the dark but should be brought out in the light because of its effect to people who have them. I salute Jennifer Niven to have written a story that spoke about these issues. Besides the fact that this book is admirable because of the topic it opened up, I also like how the setting, too, showed beautiful in the ordinary. In this book, you'd see how looking closely to see the beauty was done in the right way. Overall, I liked this book for having portrayed life at its finest and at its worst. I also commend it for capturing a very sensitive topic in an original, true way.